Amazon S3 is a widely appreciated cloud storage service. Not only it stores your data but also able to tackle the stored data in the form of accessibility. You can pay according to storage you are leveraging i.e. frequently accessed or archive data storage. But security is still what concerns most of the users. This can be handled on the ground level by creating and adding policies for your S3 buckets. What is S3 bucket policy? Bucket Policy is very similar to the access control list. Both are resource-based AWS Identity and Access Management (IAM) Policies. These services enable the user to grant access permission to other AWS account holder or IAM user. To apply the bucket policy, a user needs to add a policy to their bucket. These policies are only applicable to the bucket and the object present in it, but this permission is applied to the object that is created by the bucket owner. How to create or add bucket policies? Select the bucket in the name list, for which you want to create policy. Now in permissions, select bucket policy. In bucket policy editor window, add a new bucket policy or edit an existing policy. Since bucket policy is JSON file. So, make sure the text you enter in the editor should be valid in JSON. Why do you need to configure a metric filter and alarm for S3 bucket policy? By default, your bucket is in private mode; but bucket policy provides you with an additional layer of protection for your bucket. Any unexpected change in your bucket policy can make your data insecure. To protect your bucket policies, you need to configure a trail in CloudTrail which registers every change occurred in your policies. And if you deliver this trail to CloudWatch logs, it will alarm you for every change that happens into the configuration. Hence, you can react immediately. 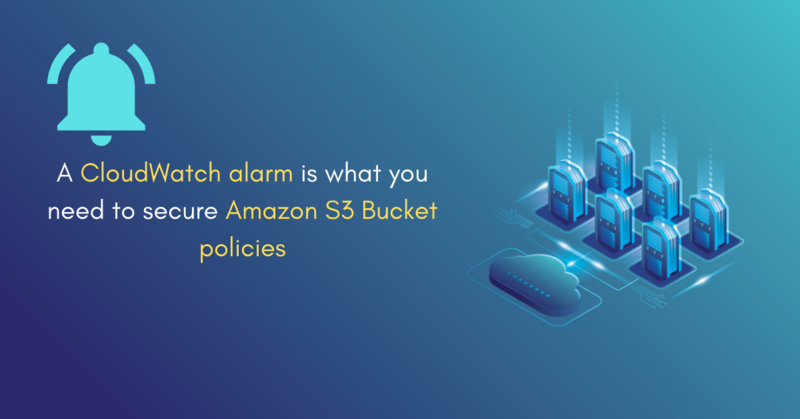 Centilytics ensures that your CloudWatch alarm triggers every time a bucket policy change is made. Whenever there is an AWS API call to add or edit bucket policy, CloudWatch alarm must notify you. Centilytics plays a crucial role since it checks for the CloudWatch alarm that you need to set up in your AWS account. It then lists down all the accounts in which the alarm is not configured. With our applicable filters, it becomes easier to understand the configuration of the Bucket Policies. Critical: Delivery to CloudWatch logs not configured. Identifier: Shows you the service with its trail name. Metric Filter Name: Shows you the name that you have given to the metric filter. Resource Tags Value Applying resource tags value filter will display data which will have the selected resource tag value. For e.g. – Let’s say a user has tagged some resource by a tag named environment and has a value say production (environment: production). Hence, the user can view data of all the resources with “environment:production” tag. The user can use the tag value filter only when a tag name has been provided.